If you are looking for Dynamic Web Development and remembered it as Dynamic Web Design, you found us. There are meanings to Dynamic Web Development. 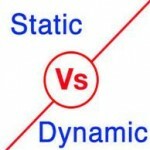 The first being the difference between a dynamic site and a static site. A static site is when all the web pages are on the web server and they never change. Just like the hard drive on your computer, the web server stores files and some of those are the pages of the website. When someone request a page with their browser, the server sends the page and the browser that displays the it. A dynamic site stores the page contents in a database, usually MySQL. There are scripts, usually in PHP, that construct the page depending what was requested from the browser. The important point here is that the page can be displayed differently depending and what was requested by the website visitor. That is what makes the site dynamic. Dynamic sites use frameworks called CMS which stands for Content Management System. These are typically Drupal, WordPress, Joomla, ASP.NET and many others. The other meaning of a dynamic site is one that has action such as a slide show which often can be seen on home pages.